This is a message from pastor and teacher Bill Knott. I have a familiar passage of scripture today and it’s from Ephesians 6:10 starting with 6:10. It says, finally my brethren, be strong in the Lord and the power of His might. Put on the whole armor of God that you may be able to stand against the wiles of the devil for we do not wrestle against flesh and blood, but against principalities, against powers, against the rules of the darkness of this age, against spiritual hosts of wickedness from the heavenly places. Therefore, take up the whole armor of God that you may be able to withstand in the evil day and having done all, to stand. Stand, therefore, having your girthed of waist with truth having put on the breastplate of righteousness; and having shod your feet with the preparation of the gospel of peace; and the verse that I want to focus on today, above all taking the shield of faith with which you will be able to quench all the fiery darts of the wicked one. And that’s a familiar passage and it’s one of the first teachings I had as a young Christian and the Lord took me back to this awhile back, and I’ve been meditating over this and studying this out, and I want to talk about two things. One, I want to talk about what the shield that Paul was describing, and then I want to talk about what the Lord has been showing me how that shield was actually used. And, I think most of us recognize that Rome, the imperial Rome army was occupying the area that Paul grew up in and lived in, administered in. And, so when he described the shield the Greek word is thureos which means a large shield as a door, as big as a door. And, that shield was the imperial scuta, which is the Roman shield, and that shield was about 52 inches tall and about 25 inches wide, and it was curved. The shield was made out of 3 layers of wood. It was actually strips of birch, and they were laid in alternating layers. One of the… a primitive form of plywood, which we know is much stronger than normal wood for the same thickness, and it was about 1/2” thick in the middle and 3/8” on the edges. The shield then was wrapped in a cloth. It had some kind of a cloth fabric, heavy cloth fabric, a canvassy kind of fabric, and then it was wrapped in leather. And, so it was very heavy leather. And, finally the front of it was finished with brass, which was a little bit of a decoration and it also provided some resistance to the arrows. Now, the unique thing with this shield is being curved is most of the time when arrows or lances, javelins would hit it it would actually bounce off because it would be hard to get an actual head-on shot at this shield, so hitting the curvature would cause them to bounce off. Now, when I was growing up in the Lord, I had always heard this teaching, and it always that we would take our shield of faith and hold it out in front of us and fend off all the fiery darts of the evil one, but the Lord took me back to this scripture awhile back. I’ve been meditating on this. How did the Roman army that Paul was describing actually use it. And, this shield of faith that the Roman army had was employed in a formation. 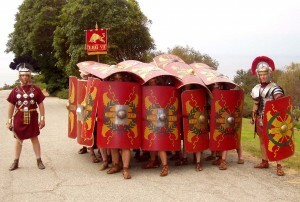 Now, if you can picture a Roman, a formation of Roman soldiers, about 20 wide and 20 deep, very densely packed marching together, and the front guys as most of us would know, the front soldiers would carry this shield right below their eyes, so their head was protected. Their feet had the metal guards on their feet, so it was like an impenetrable wall from the front. The guys on the side held them on their arms, and it was impenetrable. Whenever the Roman formation was attacked they would form what was called the Testudo, which, from which we get our word tortoise. And, what would happen is the Romans would stop, fall to one knee, which meant the guys in the front and the sides, everybody would be below those shields, and then every… And, then the guys at the end of the Roman formation would turn and face the rear. So, now you had a wall of shields and they would be interlocked. And, then all of the soldiers from the second rank to the back would pick their shields up over their head and actually lay them on top of their helmets interlocking them. So, if you can picture this, which is why they call it the Testudo, you now had a group of soldiers that were so well protected that there was no way that an arrow or a dart would ever get through this. Indeed, the barbarians often shot fiery arrows because they were terrifying to most of the people they encountered. When you would look up and you would see hundreds of flaming darts coming it would create a psychological panic that was indescribable. But, for the Romans it meant nothing because most of those darts would bounce off, and the ones that did by the time they got through the brass and in the cloth and into the leather there wasn’t anything left for that dart to do. There’s a story told of finding a Roman soldier who was guarding an entrance to a fortification and when the Roman commander approached him they counted over 120 arrows in this soldier’s shield, and he was still standing. This formation was so strong that when they came to a river they would perform the Testudo formation, and they could actually drive their chariots and wagons across the top of these soldiers. That’s how strong this formation was. This is what the Lord has shown me. We’re not called to be stand-alone soldiers for the Lord out there. We’re called to be part of an army of God. We need a covering body. We need fellowship. We need brothers and sisters to stand alongside of us and alongside of which whom we stand. And, when the enemy sends fiery darts at us we’re not called to stand and take a long sword and attack the enemy. Indeed, the Roman soldiers had very short swords. They were defensive swords. What we’re called to do is to stand together, lift up our shields of faith, interlock them, and together quench every fiery dart sent at us. As we reach out to our brothers and sisters in ministry, and we cover them with prayer we go down to one knee, we form the Testudo, and we put our shields of faith up over everybody on that day whom we’re praying for. We stand together, shields locked, covered by the faith of God, and we’re going to see every fiery dart quenched so that we may do what God has called us to do in this ministry. Bill… This is truly one of richest…most well studied and thought out 7 minute messages I’ve ever heard. Well done my dear brother, you’re greatly missed and loved! One of these days we will join that great band of “the loving joyful” where the sun does not refuse to shine and where we never have to say goodbye. I look forward to that great day together more and more( as the day spring arises in our hearts)! Be encouraged dear brother He see’s and rejoices in your faithful service given in much love…until then we stand in Him.